Kara, working on her dad’s Father’s Day gift. For the past several months, I have had a wonderful helper to help with all my fairy garden items. Kara Bowman is 14 and will be a freshman at Strasburg High School this fall. Kara loves history and is an avid Disney fan. She also is a crafter of wonderful duct tape items, wallets, flower pens and tri-fold wallets. She lives with her family in Maurertown, VA and lives on the Shenandoah River. Kara LOVES everything JMU (James Madison University) and hopes to attend school there in 2019 studying as a physician’s assistant. She just finished a medical camp at Shenandoah Memorial Hospital learning CPR, dissecting a human eyeball, and touring the operating room. You can read more about this camp here. Kara loves getting paid with Dairy Queen blizzards but has been a real asset to helping my fairy garden inventory grow. In the photo above, Kara is decorating a bowl that we made for her dad for Father’s Day. He is a big Baltimore Orioles fan. I put the above text in my newsletter about Kara but, I want to add a full posting about her in my blog. Kara is a very kind and caring individual and during the past 6 months that I have been dealing with the grief of my son John’s death, she has been a wonderful companion to have and to sit with me in the studio. Kara’s mom, Cathy knew that this would be good for me, and also for Kara, to work with me, as an assistant, of sorts. Kara is good about doing what I ask of her and is a quick learner and has a good eye for detail. She has really enjoyed doing the butterfly chairs and has looked up wonderful butterflies on her phone to replicate the colors and really enjoyed doing birdbaths. This was her first assignment and was very attentive to the different birds that she could add to the birdbaths. After the birdbaths were done, you could definitely pick out the orioles from the cardinals because she wanted them to look like the real birds. I have introduced Kara to some new forms of music and movies and she has introduced me to everything Disney…. sometimes a bit too much Disney… but we try to share and enjoy each others tastes. I would like to personally thank Kara, for being independent enough to be trusted and to know that it is okay to ask for something to eat or drink. 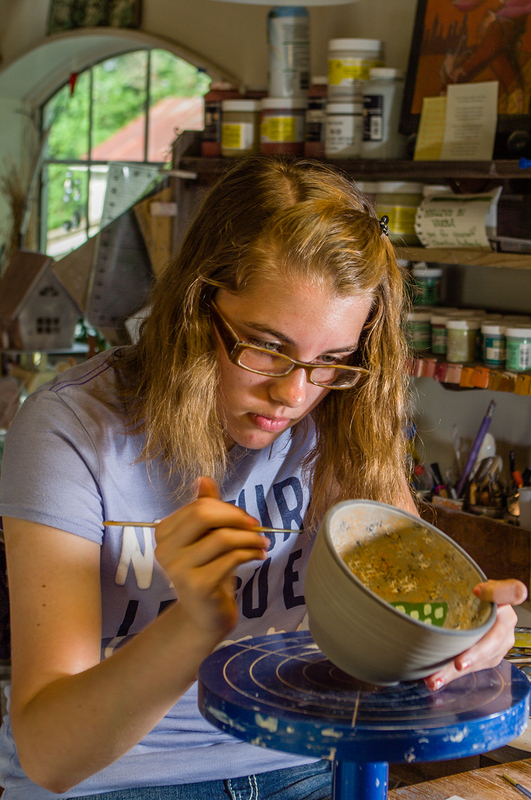 I am not sure that she will come away from this experience wanting to pursue a career in ceramics but I hope this has added some depth to her education and the understanding of crafting as a business. Kara has agreed to help me out with the Empty Bowls this year. I plan on teaching her how to make the frogs so that we can pledge a larger amount of bowls this year. The Alliance for Shelter in Shenandoah County lost a vital piece of their real estate to fire earlier in the Spring and hopefully our bowls that we contribute will help the homeless to have better shelter in the future. Kara has a caring heart and that is an organization that she holds dear so together we will do our part to help others. You would think that a Vintage Woodstock Festival in Woodstock, VA would really be about sitting in the grass, smoking weed, in a downpour of rain, listening to Janis Joplin, Grateful Dead, Joan Biaz and Joe Cocker, but this Vintage Woodstock Festival was all about eating some carnival type foods and listening to a local band called the Worx, which were amazing. The weather was unbearably hot and there was a threat of rain. I actually hoped we would get the rain so that it would cool things down some. But we got a sprinkle and a bit of reprieve from some of the humidity, but not much. I really enjoyed seeing and meeting with our local residents of Shenandoah County and letting them know that I am here working everyday and if they need a gift or and item for their garden they are more than welcomed to stop in and see me and my work. I handed out a lot of business cards and did sell a few items, but getting my name out there is a big deal. I think it is also important to do the local festivals so that people start to see that “hand made in America” is a little more expensive than Walmart or Target. I actually had a few conversations to that effect and hopefully educated some people that if you want nice things they are a little bit more costly. For the most part though, I think everyone really liked the work and I anticipate to start seeing more and more local traffic here at the house. I was also able to tell people about the upcoming Artisan Trail that we are working on here in Shenandoah County that we are hoping to be activated before the end of the year. This will be another post later but it is really exciting to be a part of this new venture for our county. Prior to the event, I mailed out about 50 postcards to people that had bought my work, both here in the county and from the DC area. I saw a lot of those people so that marketing strategy is a good one. I think because I took the time to handwrite the cards and put a note on them that I hoped to see them there made a difference too. I am still learning about marketing the business and while social media is great for getting the word out there, there is still the old fashioned post card that will do a good job for you if you take the time to apply the personalization. The next local event that I am looking into is the Ole Time Festival in Edinburg, VA. I’ll be posting as I get more information on that one but lots of folks last night said that would be a good one for me to do in the fall. Last friday I threw 10 mugs and 5 bowls. 15 pieces. Those pieces took most of that day to make. Over the next 7 days, those 15 pieces were brought to a finished level but only up to a point. Pottery is a slow process. It is something that I am learning that I need to accept the slowness of the process and be patient. I am getting there but, after being in the corporate world for so long where presses were running at $1000 an hour and you were upstream of those presses, preparing the work so as to not have a mistake stop the presses causing that price to go up for the company or the customer. I have had to slow myself down and have a different set of expectations for how quickly things get made. I don’t have a customer waiting, at least not one that I can see just yet, I also want the work to be the best quality that I can make. There is no point in hurrying if the quality suffers. That is also something that was important in the corporate world. If the press had to wait, it was better to get the work done in the best quality as possible to avoid an additional stoppage or material waste. My last post was of the trimming process of those items. I wanted to try and show that there are many steps that go into a handmade item. After the trimming was done, the handles were made and with each step the items are packed into a plastic box and wrapped with plastic to avoid them drying out before the next step can be completed. Another reason for the slow drying is to avoid attached pieces from separating from the piece. The moisture content of the handle and the cylinder that it is attached to will even out and putting them into a damp box or under plastic allows the moisture content in the entire piece to become consistent. The decoration that I have chosen to add to my work is a time consuming process in that I add a white clay body slip over the brown clay and then either draw through that slip or add a stencil that holds the white clay back from the brown clay. Then some color is added and clean up of areas where the clay or color may have bled into an area where I don’t want it. 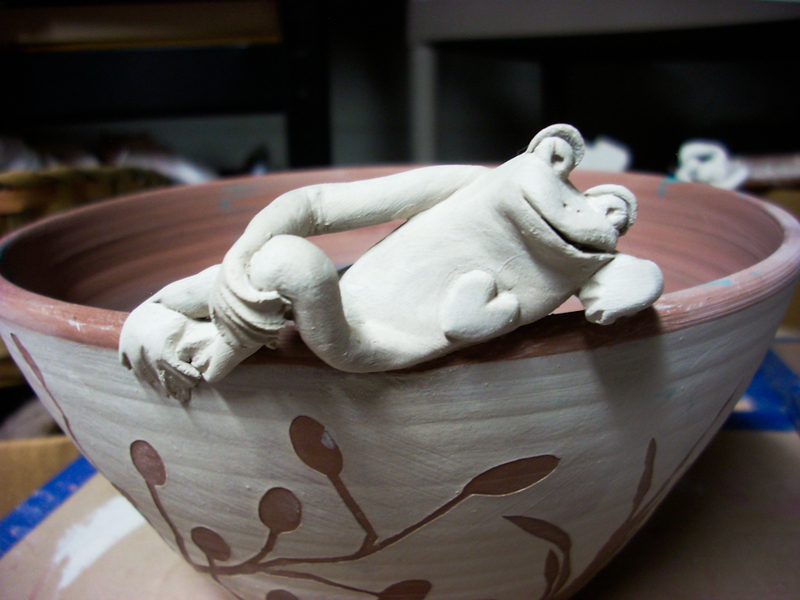 Then I am adding the sculptural frogs and give each one a personality so that each piece is unique. Handmade items are special. What makes them special is that they aren’t made with a machine, except for the wheel, and are given the attention that sets it apart from a mass produced item. That said, I’m not sure I will ever achieve the production potter status. I can see that I will use the production mindset but I don’t ever see having a set “line of work” and have items that I make for a while and then when I get bored with the pieces that I am making, I will create a new item to make for a while. So these 15 pieces will then get fired when they reach a dry state. The firing will take about 8-10 hours, then an additional 12 hours to cool. Then each piece will be glazed and fired again, an additional 8-10 hours with the 12 hours to cool. Of those 15 pieces, there will be pieces that I will discard because they won’t be the quality that I want to be representative of my work. Some of those little “blips” will stay in because that is part of the “handmade quality” that I want to achieve. A lot goes into making a mug. You might think that the mug you just bought at Walmart or Target for five bucks is just a cheap vessel for your morning coffee or tea but a handmade mug has a lot of steps to get you to that morning drink. Herb has been practicing his lighting and recently decided to photograph some of the steps of my recent mugs. Below is the gallery of those photos. the foot of the cylinder is trimmed to finish the bottom of the mug. I have been adding an additional step to that process and carving a “petal” shape into the foot ring. I divide the ring into six equal sections and carve a “V” into those divisions. The I smooth the petals to form a nice sculptural foot on the cylinder. Next a handle is made for the cylinder. This is a process called “pulling a handle” where a lump of clay is stretched with water to create a smooth slender handle shape. These are left to dry out some so that they can be attached to the cylinder in a nice curve adding to the curve of the side of the cylinder that has been trimmed. And of course, these mugs are getting a frog attachment. You’ll just have to wait and see the final product but Herb has done an awesome job of capturing the trimming and carving process.